Previous image, 26 total items. Next image, 26 total items. One of the world’s most famous buildings is surprisingly accessible; take in a show or just take a stroll to admire this astonishing building. Regularly listed as one of the greatest architectural works of the 20th century, the Sydney Opera House sits right on Sydney Harbour, and is listed as a World Heritage Site. The Opera House has several major resident companies including: Opera Australia, The Australian Ballet, Sydney Theatre Company and the Sydney Symphony Orchestra. Over 1 million people come here to enjoy performances each year, while millions more come just to admire the building, a symphony in itself. The Opera House is surrounded by the Sydney Harbour on three sides, and the view from the Monument Steps is truly dramatic. Pause on the steps to photograph the harbor and the Sydney Harbour Bridge. Make sure to get a snap or two with the Opera House’s famous interlocking white shells behind you. Much of the Sydney Opera House interior is freely accessible so feel free to look around. In the reception hall, check out the fabulous floor-to-ceiling tapestry inspired by Bach’s Hamburg Symphonies. This building is actually a complex of several venues. The Concert Hall, the Joan Sutherland Theatre and the Drama Theatre are the largest venues. The best way to see the building and all of the theaters is to book a guided tour. The Sydney Opera House Access Tour is the most popular. Wander through the house’s corridors and passageways as the knowledgeable guides share stories and secrets about the building. If you’re traveling with children, book them in for the Junior Discovery Tour, created especially for them. The Backstage Tour takes you behind the curtains and runs for over 2 hours. The Sydney Opera House is home to cafés, restaurants and bars, from the upscale Bennelong restaurant to the relaxed Opera Bar, which offers some of the best harbor views in Sydney. Check the Opera House website for details of upcoming performances, festivals and events. Public transport makes visiting the Opera House simple, and parking is available for a fee. The Sydney Opera House box office and tour information desk are open Monday through Sunday. Have a look at our Sydney things to do page to learn about more activities in the area. Discover one of Australia’s most historic and beautiful civic buildings at this popular meeting place in the heart of Sydney’s city centre. Gloriously warm soft sand, historic ocean baths and the laid-back Australian beach lifestyle make this one of Sydney’s finest beaches. Fantastic views from all angles, crystal clear waters and talented surfers make this beach a perfect spot to sit and watch the world go by. See old and new elegantly overlap in the thought-provoking exhibitions on show in New South Wales’ premier art gallery, which overlooks Sydney’s Domain. Exhilarating oceanic adventures, replica ships and interactive displays and activities, make this a great place to discover Australia’s history on the seas. Encounter Australia’s diverse habitats at this interactive zoo and come face to face with the country's most loved, feared and iconic animals. Locals and travelers from all over the world come to worship the sun, sand and clear blue waters of Australia’s most famous beach. Stroll from end-to-end or climb to the top; either way, Sydney’s “Coat Hanger” serves up memories to last a lifetime. Flanked by the Opera House and Harbour Bridge, Sydney’s transportation hub is one of the prettiest terminals in the world. This world-renowned zoo is cherished for its Sydney Harbour views and its residents. Take one of Sydney's most popular ferry rides to discover calm coves and surf beaches, restaurants, bars, shopping and spectacular views. Australia’s tallest observation tower offers incredible views, and is the perfect way to become familiar with Sydney’s layout. This wonderfully preserved 1930s amusement park serves up rides from a bygone era, and Sydney’s biggest smile! Discover Australia’s diverse marine environments, from the Great Barrier Reef to the wild Southern Ocean, right in the heart of Sydney. Engage with a world of science in one of Sydney’s favorite museums, where you’ll see working steam engines, hear ancient clocks and explore the night sky. Escape Sydney’s busy downtown and enjoy the winding pathways, art installations and rose gardens of this lush haven. Enjoy a relaxing day of sunbathing and eating fish and chips or embrace the Aussie lifestyle with a surfing lesson at one of Sydney’s most lively beaches. Once the site of rusting railroad yards and wharves, one of Sydney’s greatest urban renewal projects now buzzes with museums, boutiques and eateries. Fire up a barbecue in the park, go for a leisurely stroll and relax on the sandy shores of this gorgeous Sydney beach. Sing next to Kylie Minogue, stand next to Ned Kelly, admire world leaders or strike a pose with the star you adore the most in this world-renowned wax museum. 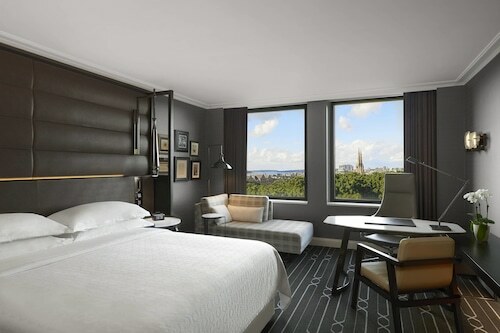 Opposite majestic Hyde Park and with views of St Mary’s Cathedral and Sydney Harbour, this luxury hotel in the heart of Sydney’s retail and business districts is a 15-minute walk to Darling Harbour. On the doorstep is Sydney’s premium retail shopping precinct for luxury and popular brands. 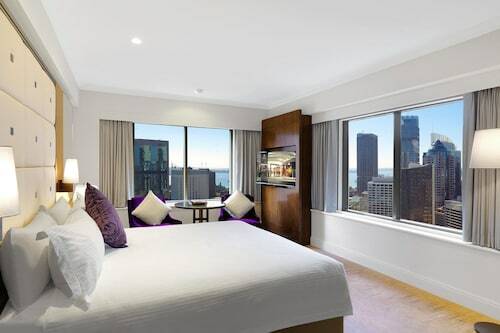 This 34-story hotel offers a stylish retreat from busy George Street, with Darling Harbour, Circular Quay, and Hyde Park all within 3 blocks. Wynyard Train Station is a 3-minute walk away. 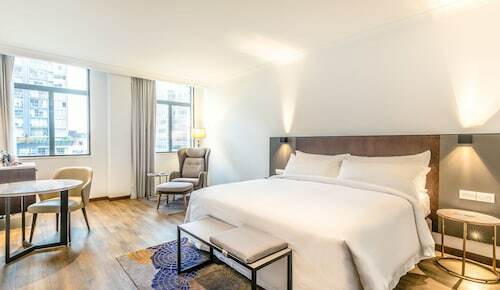 Located on Sydney's Martin Place, this central business district hotel is less than 1 kilometer from Sydney Tower, Sydney Parliament House, and Darling Harbour. 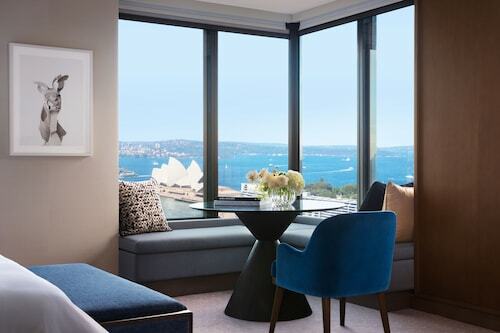 Standing in the historic Rocks district of cobbled laneways and designer boutiques, the Shangri-La Hotel, Sydney is less than 500 meters from ferries and trains, Sydney's central business district, shopping, and Sydney Harbor foreshores. Luxury and panoramic views abound at this Rocks District hotel set within a 5-minute walk of Sydney Harbour, the Sydney Opera House, and the Sydney Harbour Bridge. Located in the business, entertainment, and cultural centre, the hotel is bordered by York, King, and Clarence streets, with Darling Harbour and the Royal Botanic Gardens within four blocks.